Flanked by one of the most breath-taking lagoons in the Maldives, Vakkaru Maldives is a serene paradise that is the epitome of barefoot luxury. 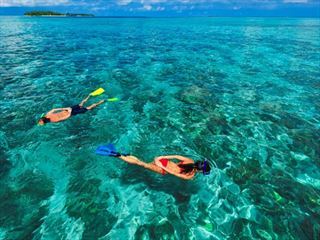 Located in Baa Atoll, a UNESCO Biosphere Reserve, you’ll be treated to sensational turquoise ocean views at every turn. Each bungalow, villa and suite here is decorated with peaceful Maldivian flair, with light minimalist interiors that let the azure waters do the talking. 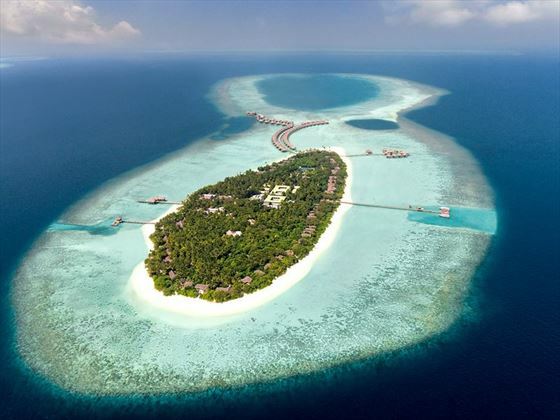 Choose from accommodation set along the powdery white sand beach, all with beachfront terraces and some with their own pool, or opt for an overwater villa that juts out over the clear lagoon and offers true serenity. 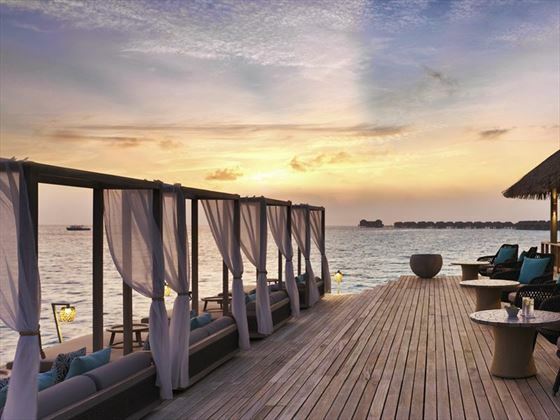 Romance is rife here at Vakkaru Maldives, from the secluded accommodation, to the Lagoon Bar with its exclusive vibes and cosy daybeds looking out onto the sunset. However, the resort is also vastly family-friendly, with a brilliant kid’s club, a family club house, and larger villas with two bedrooms. There’s enough space for everyone, neither seeming too crowded for an idyllic stay for two, or too sophisticated for a happy family getaway. There’s plenty of time and space to enjoy a lavishly laidback holiday, relaxing on the beach and relaxing to the sounds of the sea. But those who get itchy feet will find plenty to do too, from sunset cruises and kayaking, to tours around the Organic Garden and a boat trip where you can catch your dinner. 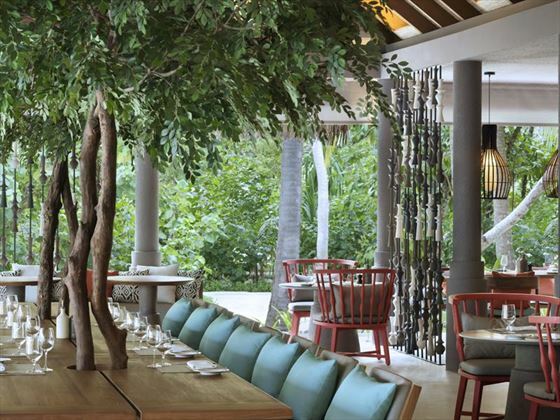 The delight of an Organic Garden makes dining here an even more luxurious affair. 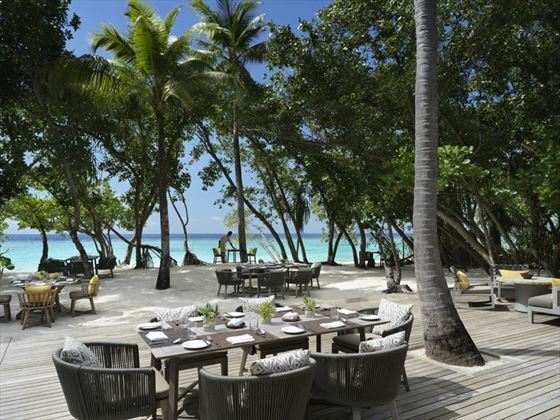 Amaany is a great option for families, offering international cuisine and fun live cooking stations, whilst Vakku boasts elegant Maldivian dishes enjoyed on a scenic al fresco deck. 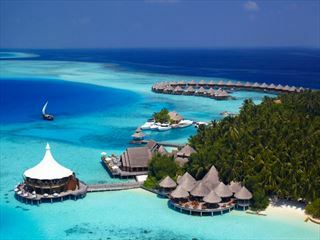 Vakkaru Maldives is a delight for any kind of traveller looking for natural beauty, serenity, and luxury. This luxurious resort is located in the Maldives’ Baa Atoll, an incredible destination that has been listed as a UNESCO Biosphere Reserve. Well-known for its impeccable natural beauty, Vakkaru boasts one of the most stunning locations in the Indian Ocean. Venture here when the plankton blooms from May to November, when you’ll see hundreds of mantas and the odd whale shark, too. Beach Bungalow – There are 12 calming 114sqm bungalows ideal for couples, located right by the beach and with a private beachfront terrace. Featuring an indoor and outdoor shower, a king bed, and direct beach access. 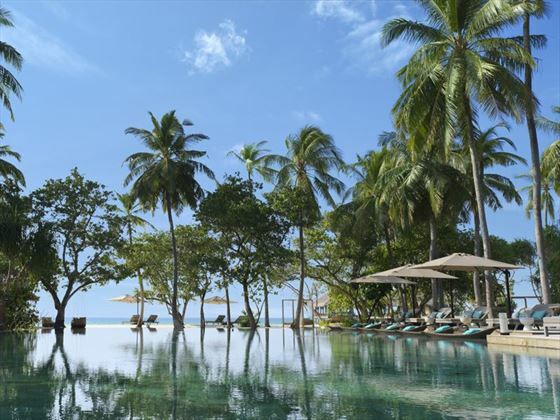 Beach Villa – These 12 spacious 143sqm villas are spread across the white sandy beach on the northern side of the island. With the same sophisticated interiors and amenities as the Beach Bungalows, the villas offer more space for families with one child. Featuring a day bed. 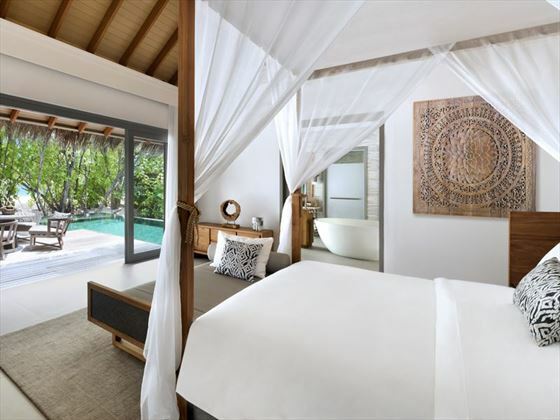 Beach Pool Villa – There are 10 secluded 250sqm villas located right by the beach, boasting soothing décor, a private 12sqm plunge pool, a private terrace, and a separate relaxation and reading nook. 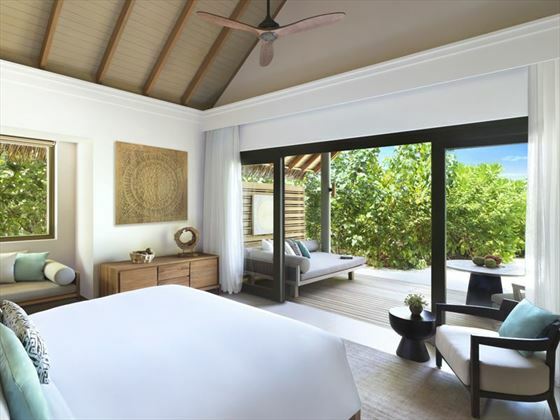 Beach Family Pool Villa – There are 20 gorgeous 250sqm villas perfect for larger families, featuring a separate sleeping area for two children, and a day bed in the master bedroom for a third child. You’ll also be treated to an outdoor pool, ocean views, and a private beachfront terrace. Beach Pool Suite – There are just five of these intimate 241sqm suites, featuring a separate living room, lagoon views from every room, and a 32sqm pool. Deluxe Beach Pool Suite – If these suites couldn’t get more luxurious, the five 283sqm Deluxe Beach Pool Suites boast a rear garden for extra privacy, with the bathroom leading straight out on to the 32sqm pool. 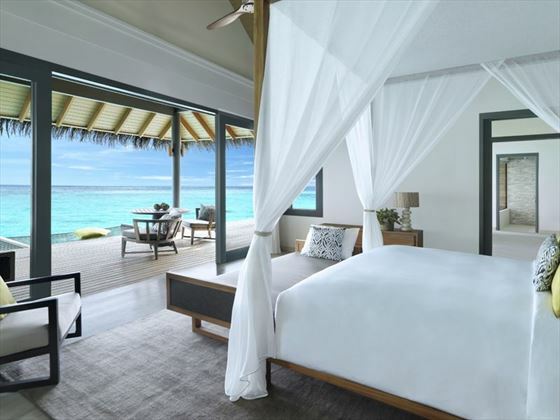 Two Bedroom Beach Villa – Ideal for families, these 12 286sqm villas feature one king and one twin bedroom with an interior interconnecting door, as well as a private beachfront terrace. Overwater Villa – There are 31 utterly romantic 140sqm water villas, perched over the crystal-clear lagoon and boasting a private sundeck with over-water hammocks and direct lagoon access. 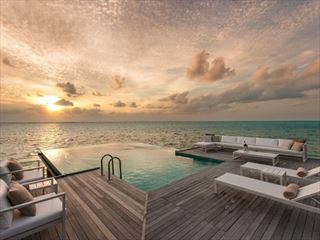 Ocean Villa – There are 12 of these 140sqm villas, offering the same glorious amenities as the Overwater Villas, but this time located near the house reef and the unique ‘blue holes’ inside the lagoon. 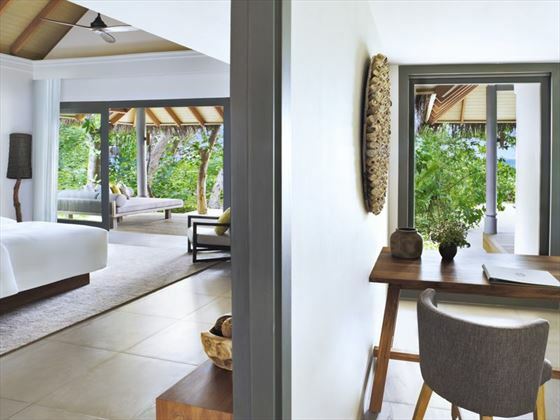 Lagoon Villa – These 10 162sqm villas offer families the chance to enjoy the turquoise lagoon. Featuring the same amenities as the Overwater Villas, plus a separate relaxation area which can be turned into a sleeping area for two children under 12. There’s also a daybed in the master bedroom for an extra child. Overwater Pool Suite – The epitome of barefoot luxury, these five 307sqm suites boast a 50sqm private pool jutting out over the lagoon, a separate living room, and ocean views from every room. Four Bedroom Overwater Pool Residence – Perfect for large groups, this two-storey overwater sanctuary treats you to unbeatable views of the sunset, as well as a 55sqm private pool, ocean views from every room, a spa terrace, a living room and dining room, a butler’s pantry, two king bedrooms and two twin bedrooms. Sleeps up to four adults and four children, or eight adults. Amaany – A welcoming restaurant offering wonderful al fresco dining and live cooking. Watch as the chefs showcase their culinary talents, all the while enjoying nourishing and fresh dishes from around the world. Open 6.30am-10.30am, and 6.30pm-10pm. 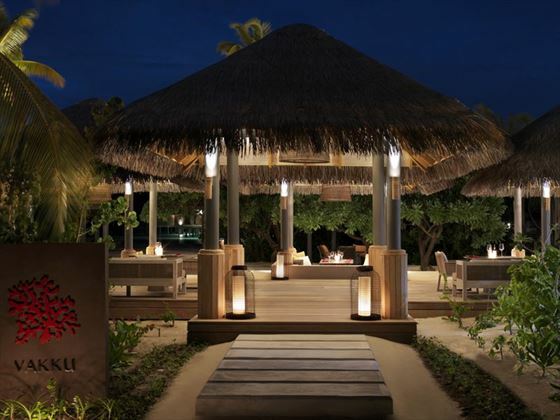 Vakku – Enjoy an authentic Maldivian dining experience at this luxurious beach grill. Dining under a thatched roof or out on the expansive deck, you’ll be treated to beautiful views of the lagoon and of the open kitchen as you dine on sophisticated cuisine. Open 12pm-3pm, and 6.30pm-10.30pm. 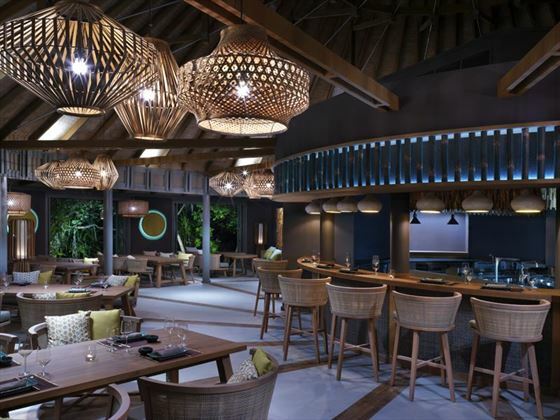 Onu – This classy restaurant will transport you to South East Asia, serving up divine traditional Asian cuisine alongside chic bamboo interiors, garden pavilions, a showcase kitchen and lounge areas. The food here is created with ingredients from the organic farm. Open 6pm-10.30pm. Isoletta – Inspired by the Italian seaside, this trendy and colourful poolside eatery offers contemporary Italian favourites. We love the communal dining table – a great place to meet other holiday goers and revel in the Italian spirit of community. Open 12pm-3.30pm, and 6.30pm-10.30pm. Cabana – A stylish poolside lounge that feels like an exclusive beach club. The ideal place to relax and enjoy a pre-dinner tipple. Open 10am-12am. Lagoon Bar – A very sophisticated bar boasting sensational sunset views, best enjoyed on the day beds where you can fully relax with your drinks and bar snacks including tapas and sushi. This bar feels romantic and tranquil, so it’s best for couples. Open 2pm-12am, with lunch offered 12.30pm-3pm, high tea 4pm-6pm and dinner 6.30pm-10.30pm. Vakkaru Reserve – The ideal spot for wine aficionados. Indulge with a wine, cheese and charcuterie experience, or enjoy a delightful bespoke tasting menu on a communal dining table for twelve. Reservation is required six hours in advance. Open 2pm-4pm, and 7pm-9pm. Destination Dining – Treat yourself to an opulent destination dining experience, including in the comfort of your villa, and at a few idyllic settings around the island. There are a number of great activities for families to enjoy together, including dolphin spotting and traditional Maldivian pole fishing. Coconut Club: Open 24 hours a day, this family-friendly space boasts an array of activities, including pool tables, table tennis, foosball, board games, and a quiet reading area. Parrotfish Club: This fun and vibrant kid’s club offers fantastic opportunities for children aged 3-12 years. They can take a break from the sunshine and enjoy activities such as indoor crafts and cooking classes, or there’s a great outdoor play area with a pool. Open 8.30am-6pm. Includes dinner from restaurant menus in Onu, Lagoon Bar or Isoletta (three courses per person) and table d’hote menu in Vakku Grill Restaurant. Children under 12 dine on a complimentary basis from children’s menus in restaurants or if dining a la carte then they receive 50% off adult menus with children’s portions served (excluding Vakku). Children aged 12-15 enjoy 50% off adult pricing with children’s portions served (excluding Vakku). Includes dinner from restaurant menus in Onu, Lagoon Bar or Isolatta (three courses per person) and table d’hote menu in Vakku Grill Restaurant. Lunch is included from the menu at Lagoon Bar and Cabana Pool Bar. Includes all drinks during dinner, including wines by the glass, house pour sparkling wine, soft drinks, beers, standard house pour spirits, juices, water and tea and coffee. Children’s pricing includes juices, water, soft drinks and milkshakes in all restaurants during dinner for children aged 12-15. For children under 12, there’s a supplement of $35 for free-flowing drinks during dinner. Premium spirits, champagne and wines by the bottle are not included. Includes lunch including drinks from the menu in any of the open and available options including Lagoon Bar and Cabana Pool Bar. Throughout the day, you can enjoy selected wines by the glass (including house pour sparkling wine), as well as standard house pour spirits, beers, soft drinks, tea and coffee, juices and water in the Lagoon Bar, Pool Bar and all restaurants between 11am and 11pm. Children’s pricing includes soft drinks, water, milkshakes and juices in Lagoon Bar, Pool Bar and all restaurants for children aged 12-15 years. For children under 12 years, there will be a supplement of $65 applied for free-flow drinks throughout the day. 12 units of Beach Villa and 12 units of Two Bedroom Beach Villa will be closed for private pool construction. 10 units of Beach Bungalow will be closed for outdoor Jacuzzi construction. Other Villas and recreational areas remain open and fully operational.